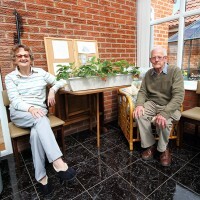 York Open Eco Homes annual events are part of the national Green Open Homes which provide opportunities to visit living demonstrations of energy saving and other green living measures, learn from their experiences and share yours. 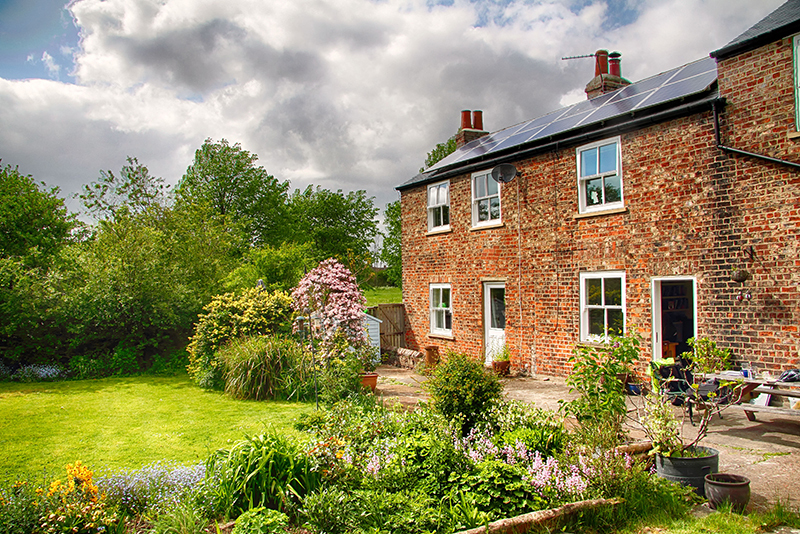 In the past years these have included: Little Eco Terrace, 1990s bungalow with edible garden and 100+ year old semi. This year’s event was called Homes for the Future and the sunny day turned out brilliantly. We started it with a delicious vegan lunch from haybox cookers (after 3.5h in the insulated cookers, yummy food was still at safe temperatures of nearly 80 degrees! ), served with discussions on low impact cooking and basics of how to super-insulate houses. 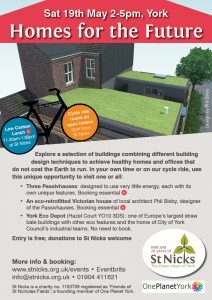 Twenty cyclists then took off through the reserve to the City of York Council Eco Depot to look at the straw bale construction, admire its live solar PV data and pick up i-Travel York goodies. 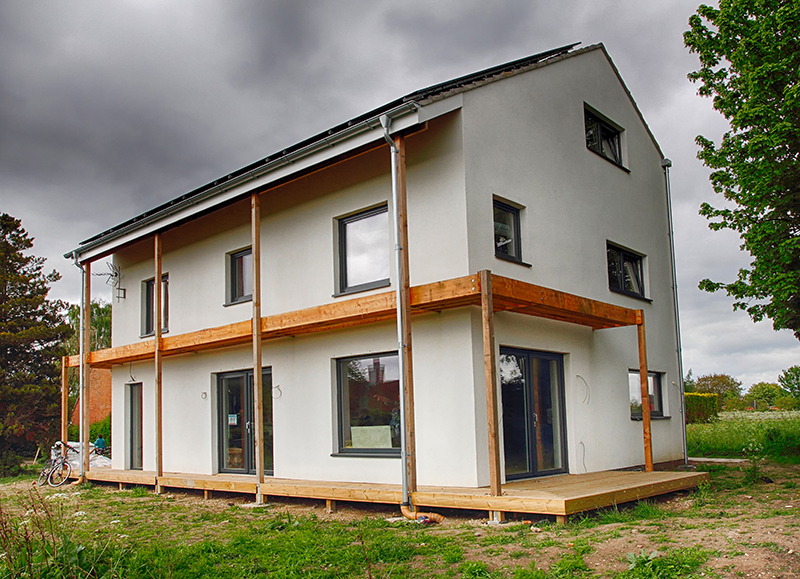 Then we went on to 3 Passivhauses – insulated so well that little active heating is required. After 2.5 years the oldest one is performing as predicted and keeps around 19-20 degrees throughout the house all year round, including the depth of winter! 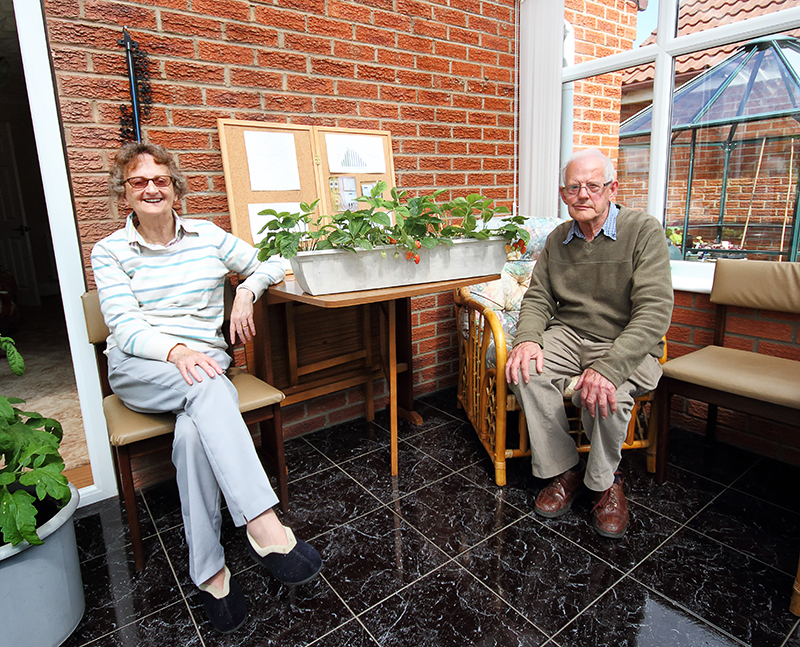 Although the guiding principles for designing and building them was the same, each of the visited homes looked different and had unique features ranging from a wildflower meadow to being adaptable to the occupiers’ changing needs as they grow older. The last but not least stop was an eco-retrofitted Victorian house of local architect Phil Bixby who designed the Passivhauses and was happy to talk visitors through both processes. Below you’ll see Phil in a short video about the event by That’s York TV, explaining why it’s important to build energy efficiency into homes. All in all, it was a highly inspiring and successful day – you will find photos from the day via this link. In 2017 we aligned our event with SuperHomes September and tried a different model. 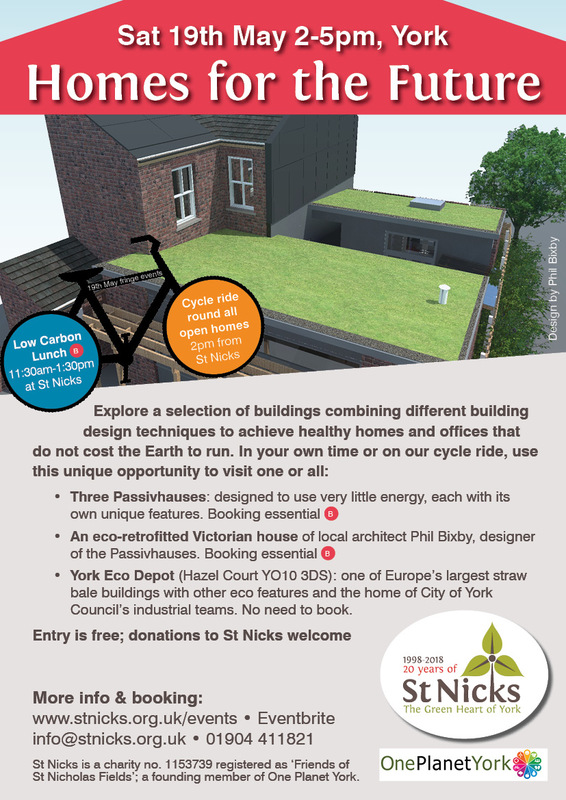 We brought several home owners to St Nicks Environment Centre to give an illustrated introduction to their eco homes and encouraged visitors to arrange individual visits for those interested at a later date. This turned into a great afternoon filled with inspiration and tips on how to go about building or eco-refurbishing a home, including flood resilience (see the video below). 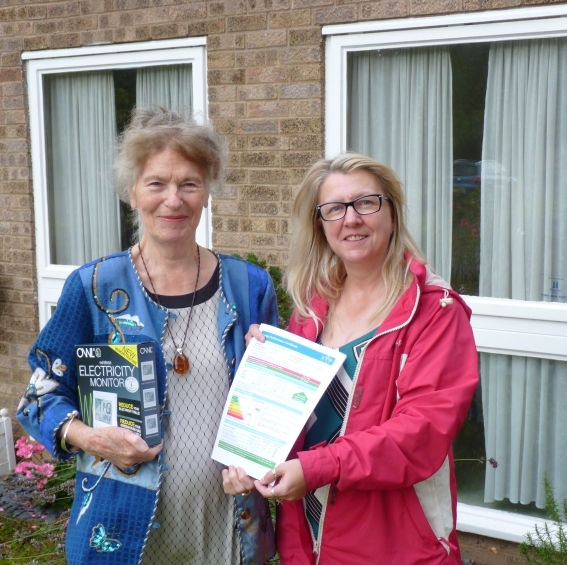 Winner of the event visitors survey prize draw Pat Hill with energy advisor Alison Webb. 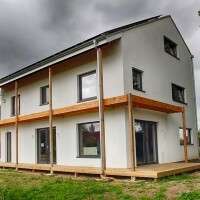 The prize was an energy performance certificate for Pat’s house and energy monitor. 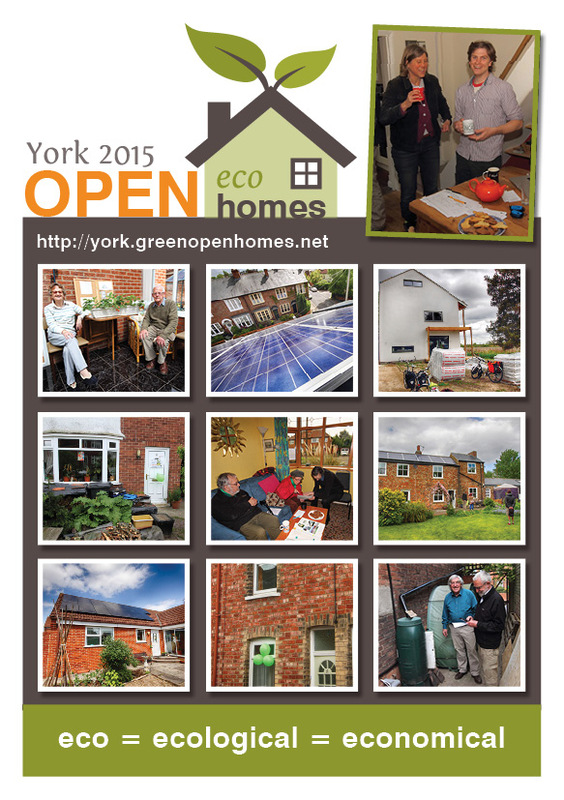 The second York Open Eco Homes was held over the weekends of 14th and 21st May 2016, with a follow-up Future-Proof Your Home workshop on Saturday 11th June. You can see from the event flier that an architects’ studio and an eco holiday home opened their doors to visitors alongside regular homes. The 2016 events was backed by social housing procurement consortium Efficiency North’s EN:Able Community Investment Fund which offers funding to Yorkshire and Humber based projects in support of efficiency, community investment, workforce development and environmental sustainability across the region. We have also gratefully received a £1,000 donation towards it from the former York Green Festival. The first ever York Open Eco Homes (YOEH) event held in May 2015 was a great success with over 300 visits made by around 200 people to 13 local homes. This is a significant part of the total 967 visitors at the 16 spring events around the country which were also funded by Green Open Homes Network! 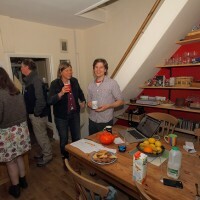 The event also sparked a quarterly series of talks run by one of the Eco Homes hosts, Tomas of Little Eco Terrace, whose blog is brimming with tips and experiences of turning the cheapest terraced house in central York into an “A” rated “eco home” (as per Energy Performance Certificate) for around 10% of its purchase value. 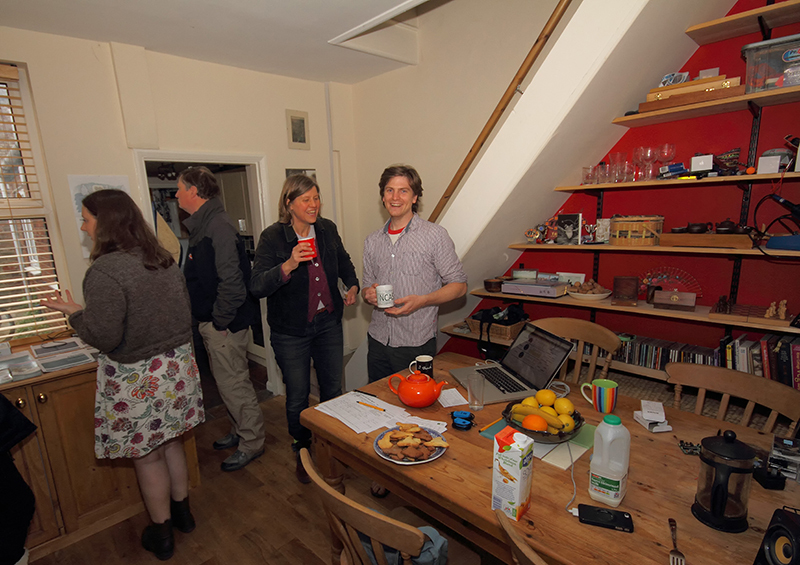 December 2015 – Eco Show & Tell which encouraged people to bring items costing less than £50 that had helped make their homes cosier to live in, cheaper to run, and/or more sustainable. You can find Tomas’s write-up of the event and items shown on his blog.